HP’s Newest Latex R1000 is Here! The latest and greatest R Series by HP has been impressing the industry since the HP Latex R2000 was first announced in March of this year. 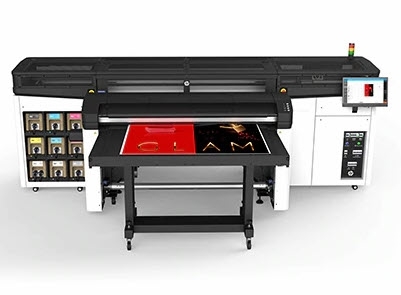 Today, HP added the 64-inch HP Latex R1000 Printer to the line-up, and it is here! IT Supplies had the honor of receiving the first model (that is serial number 001!) installed in our showroom! Printing in white without waste: HP Latex White Ink delivers the glossiest white on transparent and colored media and achieves no waste between white print jobs. The removable HP Thermal Inkjet Printheads can be stored in an offline rotating chamber and automatic maintenance makes white like any other color, including automatic recirculation and nozzle checks. High image quality and vibrant colors: HP Thermal Inkjet Printheads and redesigned HP Latex Inks achieve vibrant color gamut that is wider than most flatbeds on the market. These latex inks preserve the media gloss and feel while printing on rigid or roll (with optional roll to roll kit). Durability and versatility: HP Latex Overcoat adds durable and flexible water-based ink for high adhesion and scratch resistance while lower curing temperatures allow for wide range of rigid and roll media versatility. This unit supports media widths up to 64 inches. Rigid material can run up to 2 inches thick. Productivity: The belt workflow enables customers to handle print peaks in-house and meet short deadlines with up to 614 square feet per hour with up to 150 lb rolls for flexible printing. Ease of use: This printer supports advance features that helps prevent head crashes. Automatic maintenance and smart vacuums make this printer easy to load and operate. Reduced down time: The R1000 has affordable printheads that are user replaceable. Stock printheads right on your shelf to prevent downtime. A printhead replacement takes minutes and does not require any tools. It is ideal for medium-sized PSPs that have a requirement for rigid applications but want the flexibility to also print roll-to-roll with the same device and thus ideal for growing businesses with investment and space constraints. Time will tell if HP’s marketing machine will be able to overcome these hurdles. However, Keypoint Intelligence sees the potential in Latex with the higher performance R ink-set..
thanks for publishing this newest latex r1000 model of hp. HP is one of the giant in the printing industry it has a wide range of products which quite useful for its customers. Thanks for sharing this wonderful and informative articles with us. HP Latex Overcoat adds durable and flexible water-based ink for high adhesion and scratch resistance while lower curing temperatures allow for wide range of rigid and roll media versatility.